Unbelievable sunrises... Watch the dolphins and shrimp boats right from your balcony! Enjoy oceanfront dining from our balcony. Free secured and password protected wifi access for your computer or smartphone. Gated community just south of the Ritz Carlton. On property - four clay courts at your disposal day or night; two pools on property. Miles of beach to walk. Lush bike and running paths. Pets are NOT allowed, NO Smoking. Hello - We are Madeline and Anthony and we hope to welcome you to our condo at beautiful Amelia Island. We have been visiting the northeast coast of Florida for many, many years. And after just our first visit to Amelia Island, we decided that this is the best that we have been to - quiet, peaceful, wide beautiful beaches - just charming in every way. The unobstructed oceanfront view from C109 was all that we needed to decide 'this is it'! All that you could want from a vacation - golfing, fishing, boating, tennis - quiet, pristine beaches, and the quaintness of the area. There are lots of shopping and restaurants to choose from. However we enjoy most of our meals on the balcony. Please call me at 404.663.5936 - I'm happy to answer any questions you might have. Direct oceanfront with spectacular view of beach and ocean. Full size washer in condo. Full size dryer in condo. Plenty of gated parking on site. Just bring your beach towel. Flat screen TV, DVD player. Flat screen TVs in living room and bedroom. Flat screen TVs in both the living room and bedroom. A good selection of hardback and paperback books. Bar height furniture to enjoy the view. Covered balcony for protection from the sun. Great place to enjoy your meals. Beach chairs and swim noodles are in our guest's closet. We had a wonderful time on our trip to Amelia Island. Quiet and relaxing with an amazing view! The condo is cozy and super comfortable with a great location for exploring the island. The management company was very helpful in answering our questions both before we arrived and while we were there. We will definitely be coming back to Amelia Island in the future! too. We had a great time! Well maintained oceanfront unit in a quiet neighborhood close to the Ritz-Carlton. Excellent response by the management company to a problem with the A/C. Owners are very customer friendly. Would highly recommend. The condo was just as nice as the pictures!! Beautiful! The condo was beautiful and very clean. The views were amazing! It had everything that we needed for a week at the beach. I would highly recommend this condo and property to everyone. The property was amazing, very convenient to all the activities that we wanted to see & do, close to restaurants and right on the beach!! We absolutely loved our week on Amelia Island and will be back! I found the overall home away from home exactly what we were looking for in a short getaway. Clean, adequately supplied kitchen, quiet are just a few descriptions. We slept with the door open and were able to wake up to the sounds of the ocean. The distance to the beach was enjoyable. We were able to sit on the deck the last day and not freeze, a beautiful view. We did not turn the TV on once. There is a rich history to the island and Fort Clinch played a part in our historical enjoyment as well as the local historical museum located near 3rd st. Once Monday came there were window washers and grounds takers that were quite noisy, but nothing that would have deterred us from coming. I recommend this home away from home. 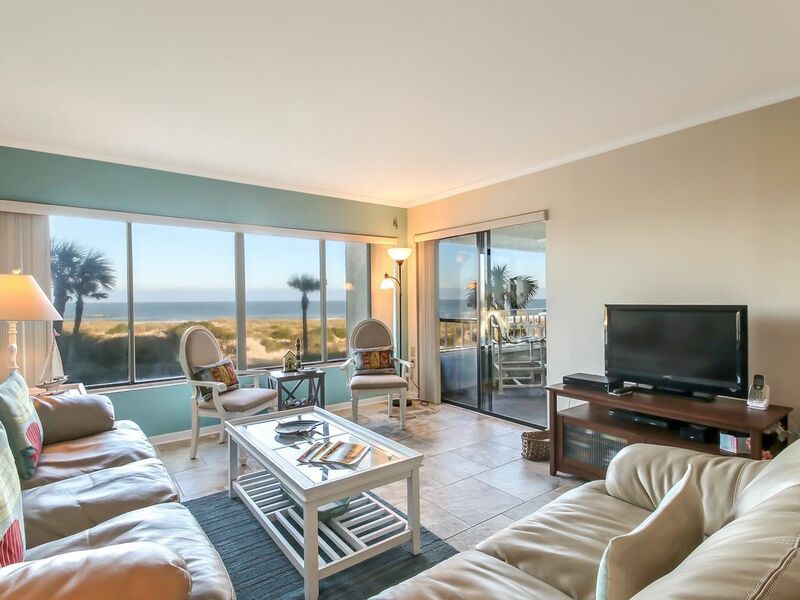 We enjoyed our stay and would return again to this lovely oceanfront condo. This was our fifth stay on Amelia and our first stay at this resort. We were more than happy with the unit, especially the view. Well maintained with comfortable furnishings and a full kitchen. We loved walking on the beach and riding our bicycles around the island. The owners are a pleasure, as are the local management team. Dining, shopping, etc. in Fernandina Beach. CANCELLATION POLICY NO REFUND FOR CANCELLATION WITHIN 30 DAYS PRIOR TO ARRIVAL DATE. REFUND OF DEPOSIT LESS 10% FOR CANCELLATIONS MADE 30 DAYS OR MORE BEFORE THE ARRIVAL DATE. PROPERTY MAINTENANCE FEE IS NON-REFUNDABLE. WE WORK WITH A MANAGEMENT COMPANY ON AMELIA ISLAND. ONCE THE COMPLETED AND SIGNED RENTAL AGREEMENT IS RECEIVED BY ME, I WILL EMAIL YOU THE MANAGEMENT COMPANY, CHECK IN AND KEY DETAILS. THANK YOU.